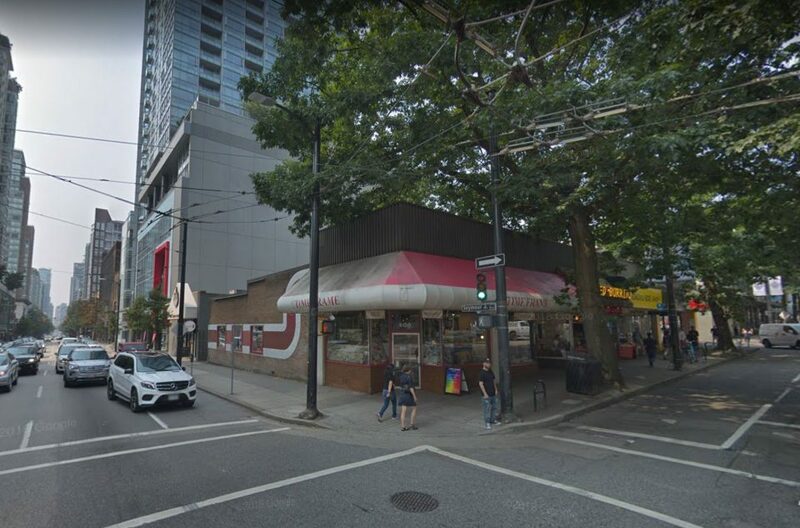 The corner of Robson and Seymour will soon look a lot different with a 13-storey office and commercial building proposed. Owner Bonnis Properties has engaged Perkins + Will to design a new building for the corner site, adjacent to Capitol Residences. 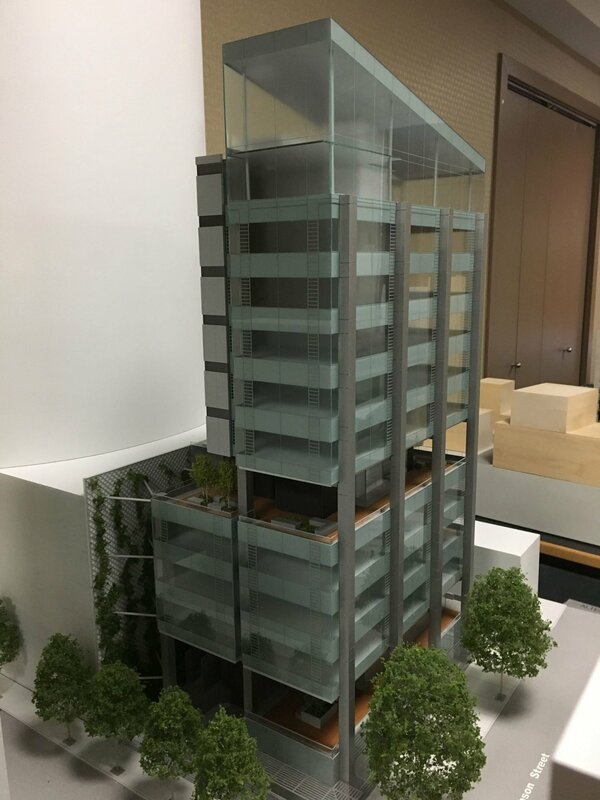 Model of new office building proposed for the corner of Robson and Seymour. 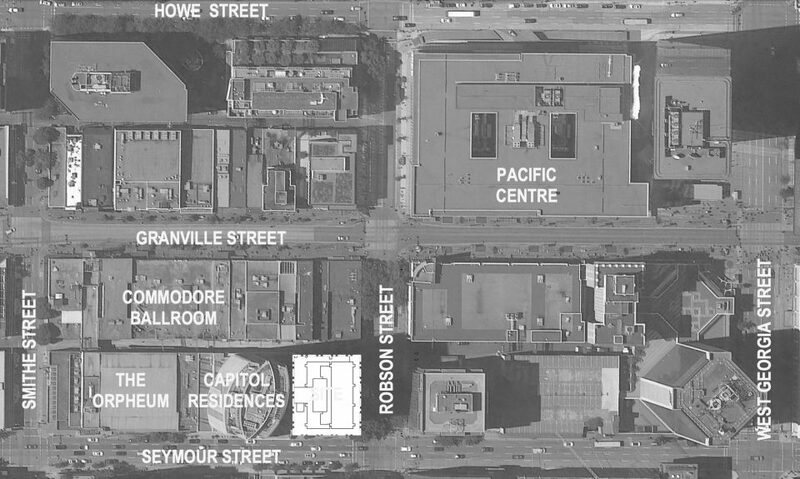 The property at 600 Robson Street consists of a small one-storey retail building, currently home to several retailers, including India Gate Restaurant, which celebrated its 40th anniversary last year. Another tenant of the block, City Cannabis, has already applied to the city to move its shop across the street to the former 7/11 location, beneath the Winners and Best Buy stores. That building is also owned by Bonnis Properties. 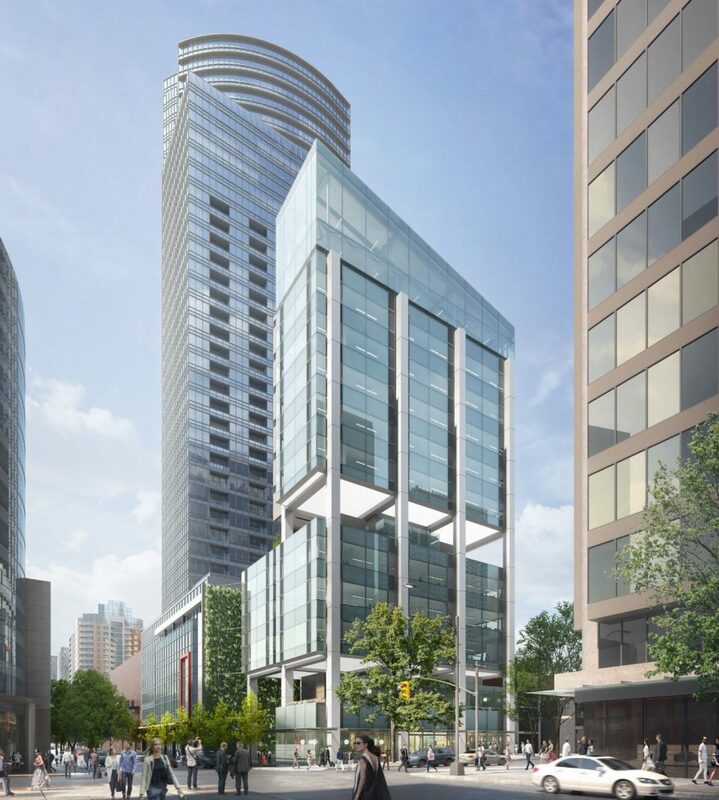 The new building at 600 Robson will have approximately 61,000 square feet of office space, and just over 4,000 square feet of ground floor retail. Despite the increase in density, the development will actually result in a wider sidewalk along Robson Street, as well as a new entry plaza and ivy green wall along Seymour Street. 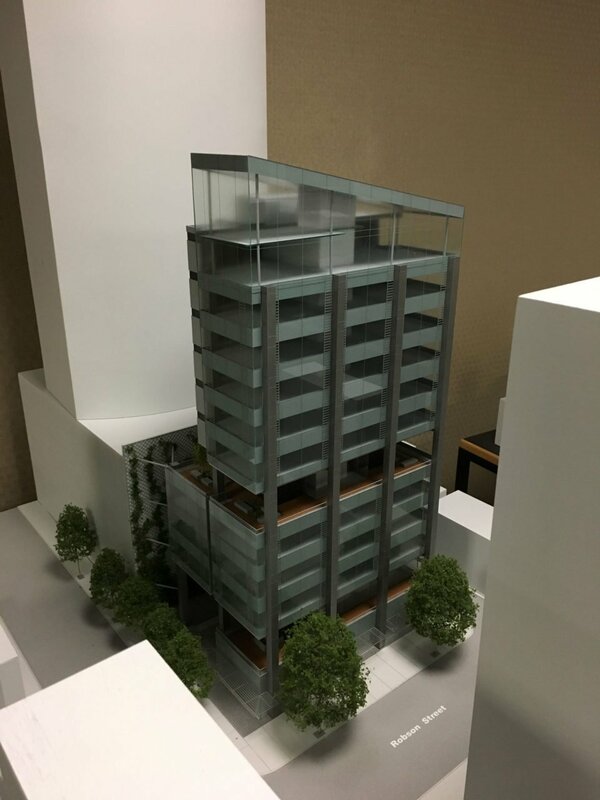 The large red oak trees along Robson Street will be retained, with the building designed to accommodate them. An amenity garden with landscaping on level two will allow the trees to branch out. Office tenants will also have access to a gym and outdoor terrace on level six. The terrace will include a garden with planted vegetation, providing natural scenery for residents living in the adjacent Capitol Residences building. The architect says the elevation of the outdoor terrace is designed to match the height of the existing Capitol Residence rooftop garden. “This configuration creates the greatest possible consideration for the existing amenity space in the adjacent building, and demonstrates a considerate approach to development,” states the design rationale. The exterior of the building will be clad in a combination of textured metal, cement tile and spandrel glass. A total of 52 underground parking spaces over three levels will be provided. Bonnis Properties is also behind the revitalization of the former Tom Lee Music building on Granville Street, now home to Spaces co-working office space. The company is also planning to develop a residential building at the corner of Main and Union, on the current location of the Brickhouse and Jimi Hendrix shrine, elements of both which will be incorporated into the new building.